Over the last 15 years Eloy´s Frank Borneman has been working on a rock opera dedicated to Joan of Arc. The next step will be taking this opera on the road. In addition to the large choirs and orchestral sounds, Frank will also be supported by Eloy, making the work part of the band's core discography. 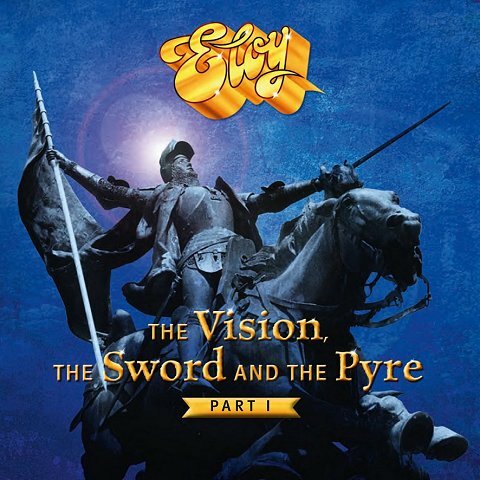 The music for "La Vision l'épée et le bûcher" or "The Vision the Sword and the Pyre" will even be sung in two languages for the live appearances. The show will also go on the road in Germany under the title "Die Vision, das Schwert und das Feuer", with lyrics in German. It goes without saying that this project presents an enormous challenge, especially for Frank as the author of the content. As such, fans will have to wait patiently for the music to be released on CD. Only then can work begin on the stage production – as soon as the financing has been secured and the cast for each version is in place. Being an Eloy fan way from the early seventies, I hope to get a chance to see this show on the road somewhere. The oft-cited work on the topic of Joan of Arc is taking form, and there will now not only be a rock opera by Frank Bornemann, but, first of all, another ELOY album presenting the music on which the later the musical framework for the stage version will be based. I have long said goodbye to the idea of composing a stage work, or even presenting a musical in which the dialogues fill the content with overblown singing - generally to the detriment of the music. Rather, I intend to create a complex artistic work in which the musical part assumes a greater responsibility - in other words, something beyond the scope and purpose of known works - without neglecting the subject which, I admit, as a history aficionado and member of the »Association des Amis du Centre Jeanne d´Arc« in Orléans, is very important to me. Since the album »Power And The Pasion« (also termed a rock opera back then) I have not, perhaps with the exception of the double concept album »Planets« / »Time To Turn«, devoted myself to a work which has a continuous storyline or even historical events as a basis. Such works always require a lot of time and are a much greater challenge than a band album, which doesn’t have such stringent requirements in terms of content. In the case of the story of Joan of Arc, I have set myself, musically and lyrically, a very high benchmark, which, particularly by sticking to the historical events, demands a high and consistent accord between content with the music. Although the realisation of this project has been going through my head for over 15 years, I only now for the first time have the opportunity to address it and meet the challenge. The idea to combine it with ELOY and to put a version of it to tape first, which, at the same time, also underpins the continuity of our common musical creation as a band, only came to me when I was layouting and composing. It took some time until it was clear to me that the best way for this musically and thematically ambitious work to see the light of day would be through the band. It is now likely to take for several months before even the music is complete, the texts are fully written, and all the layouts for the final recordings have been created. And another few months will surely have gone by before the recordings are all wrapped up, but then you can be assured that you can expect a very special work which, I am convinced, will rank at the top of our releases up till now. Firstly, sorry for the long communication hiatus on our part. The band has been on a break and as such there has been no news. Unfortunately, we no longer live all in one place, have very different lives, and it has become more difficult to organise things together. Nevertheless... »the fire is still burning« and I have always succeeded in reactivating ELOY in a mostly stable formation! Our very successful concerts in 2011, 2012 and 2013 were met with truly sensational feedback – both in the media and by you. This has led me to take on a very special, highly complex work whose realisation will require more time and effort than was ever necessary for any of the band’s other projects. I am aware of what I am letting myself in for but, motivated by the experience of the tour, I wanted a lofty goal and have set the bar very high. I have chosen a topic that I have had in mind for many years and originally intended to use for a solo project and stage work: namely the equally unique, touching and fantastic story of Joan of Arc, for which I have found the highly appropriate and distinctive title, »The Vision – The sword – And The Pyre«. With my deep knowledge of the story, I had no shortage of musical vision for this ambitious work. I envisaged a musical melange combining diverse tonal and stylistic elements that merge by the end to a coherent whole. An emotional musical firework with powerful choirs and symphonic orchestral arrangements but also forceful guitars, pulsating rhythms and atmospheric waves from the keyboards. Since those are indeed all essential aspects represented by ELOY, I quickly came upon the idea of producing the work not only as a musical spectacle for the stage, but to invite my fellow musicians from the band for a creative role in creating a two-CD concept album. Although the circumstances mentioned above mean the working conditions are not optimal, and therefore everything will take significantly longer, this creative challenge is certainly worth it. I am therefore very pleased that I could persuade my scattered bandmates to once again accept such a challenge, despite the significant organisational difficulties. Thank you for your patience. I am of the firm conviction that we will be able to put an end to the wait before the year is out. You can expect a work full of energy and passion. Let yourself be surprised! Check Eloy's Website for more.